An interview between Phil Kreindler and Jenny Lloyd-Jenkins, European Sales Training Manager for Elavon, a global Merchant Services provider. PK: Jenny, I work with a lot of Sales Training Managers and nobody I know does a better job of implementing training and getting results. I want to ask a few questions to find out the secrets of your success and share them with our readers. Can I start by asking you what you think are the biggest challenges facing Sales Training Managers? JLJ: Thank you Phil. I think the single biggest challenge for Sales Training Managers is to get a voice at the top table. Sales Training is not a function that is automatically involved in strategic conversations. PK: So how do you go about getting involved at that level? JLJ: I had to earn credibility and treat internal stakeholders like customers. I made sure I connected with Senior Managers and fully understood their drivers. Then I looked at strategies to support them and agreed the success criteria and ways to measure them. Then it’s a matter of sharing the success stories with the Senior Management Team (SMT) so they understand the contribution we are making. I’ve reached the stage now where I am included in the strategic planning process and the SMT take notice of what I say. But that is based on the results I have delivered in the past. JLJ: Oh plenty! Requirements are changing all the time so we have to be agile, we have to make sure participants in the training sessions value them, we have to train people for the job they are doing now and develop them for the future, we have to deal with various national cultures, we have to build bridges between Sales and other parts of the business and we have to work on developing a coaching culture as well as acting as Coaches. PK: That is a lot to keep abreast of. Could you go into a little more detail about those points, starting with coaching? JLJ: Coaching is certainly the place to start; it’s fundamental to the way we work at Elavon. In my view Sales Training is a waste of time and money without follow-up coaching to support on-going learning and application. 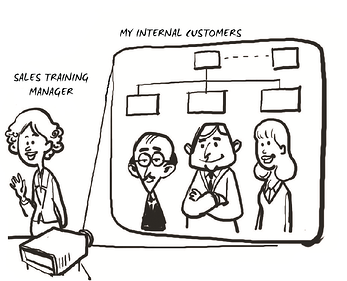 All the Sales Managers are trained in coaching skills as we find it is by far the best way to get the most out people. In addition to training people to be coaches, I function as an internal Coach. In certain situations it’s very useful to have someone who is neither a line manager nor from HR. PK: I am interested in what you said about making sure participants value the training. JLJ: Well firstly they have to enjoy the training, so we make sure it is relevant, interactive and lively. We use real situations they are familiar with as the basis for exercises. Then we make sure there are things in the training that they can use straight away in their day-to-day work. And we ensure that managers follow up and coach the application in daily business. PK: When do you act as a Coach? JLJ: If someone is interested in pursuing a new career path or is in doubt about their best next steps that’s where I may intervene as a Coach. Sometimes people in Sales can’t see a clear career path. I am currently coaching a great Sales person who is considering moving into Sales Management: I help them explore all the implications of that move – good and bad! PK: Can you tell me about some of the cultural issues you referred to? JLJ: For example, in some of our markets the business culture is very much about giving people direction. Managers tell staff what to do. Our task there is to help the managers to develop their coaching skills authentically in order to bring out the best in their staff. PK: And you mentioned something about building bridges? PK: A question that interests me in particular, what in your view are the do’s and don’ts external Sales Trainers should be aware of? PK: Could you sum up what you feel are your success factors? JLJ: OK, I can be effective because I have earned a position to sit within the European Senior Management Team. I achieved this by networking internally, being collaborative and sharing our successes – success breeds success after all. Also my work as an internal Coach has earned me respect and I include in that coaching the Senior Managers. I make a point of understanding who the internal customers are and what drives them. I create bespoke solutions for each channel and combine a consistent approach with agile responses to changing needs. Training in core Sales competencies is essential. They have to be accepted across the organisation and managers have to know how to coach their teams to develop them. A constant review and evolvement of core sales programmes is critical to sustaining growth, development and sales success. Finally I would say you have to be willing to challenge current thinking and old ways – but make sure you have something better to replace them! PK: Thank you Jenny for a fascinating insight into how you have made such a success of Sales Training at Evalon. I am sure our readers will be inspired to match your success. Enjoyed this blog post? Download our eBook.